“Whether Republicans repeal the law or destroy it, it’s all bad news for patients. Without the Affordable Care Act, Americans with preexisting health conditions, like diabetes or mental illness, would either get denied insurance or have to pay a crazy amount of money. Insurance companies could reinstate lifetime and annual caps on your benefits, meaning they could cut you off just when you really need it. Women would pay more for insurance than men – just because they’re women. 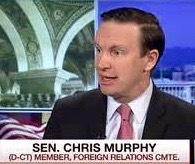 And seniors would pay thousands more a year for prescription drugs.” – Senator Chris Murphy (CT).